← Sorry, that last post went out unedited! Planning for cruising in a barge can be essential – but should be worthless. As a fellow bargee recently quipped “just keep your plans set in jelly and you’ll be fine”. It’s often necessary to have some idea of where you are going, and how long it will take to get there, so you know exactly how much of the rest of your time can be spent dawdling elsewhere. We know we will start in Groningen, NL at the start of July and want to end up somewhere in Belgium (yet to be finalised) at the end of September. Once we have booked somewhere for winter 2015/16, that will be definite. However, we can make a pretty good guess/wish if we say that we will end up in Bruges (for the English and French) or Brugge (for the Dutch) or nearby. Bargees use a variety of means to plan trips, but a commonly used tool is PC Navigo. Not cheap, but very comprehensive. Also good as a navigation tool. Into it we enter the dimensions of ‘Neo Vita’; an estimate of average cruising speed; our preferred cruising hours/days; and start and end point. It will automagically generate a route which our barge can navigate. Then we are able to customise this route by selecting options such as the ‘fastest’ or ‘shortest’ or ‘tourist’ route, and specify places we wish to go to, or that we want to avoid. Then it refines the plan. A useful number is how many days this cruise will take, uninterrupted. If we take that number away from the total time available, and make some allowances for startup and shut down, we can then determine roughly how much ‘wobble’ is in the plan. Thus we find that PC Navigo tells us the cruise will take 20 days, uninterrupted. Allowing ten more for start up and winterising at the end, and seven days for a side trip to Bavaria (not by barge! ), that makes 37 days allocated out of a total available of 83. This means there are 46 ‘dawdling’ days for the 20 spent actually cruising. About two days loitering for each day travelling. Perfect! While we haven’t quite settled on the naming of this year’s cruise, last year we used “Finding ‘Neo Vita'”, so perhaps this year it might be “Returning ‘Catharina Elisabeth'”. Sounds good to me.How exciting.Good luck with plans. Thanks Jeni, hope to see you and Ade on board sometime in the future. Ian… We loved the Randmeeren, the route around the old Zuiderzee coast, but don’t short-cut across through Utrecht. 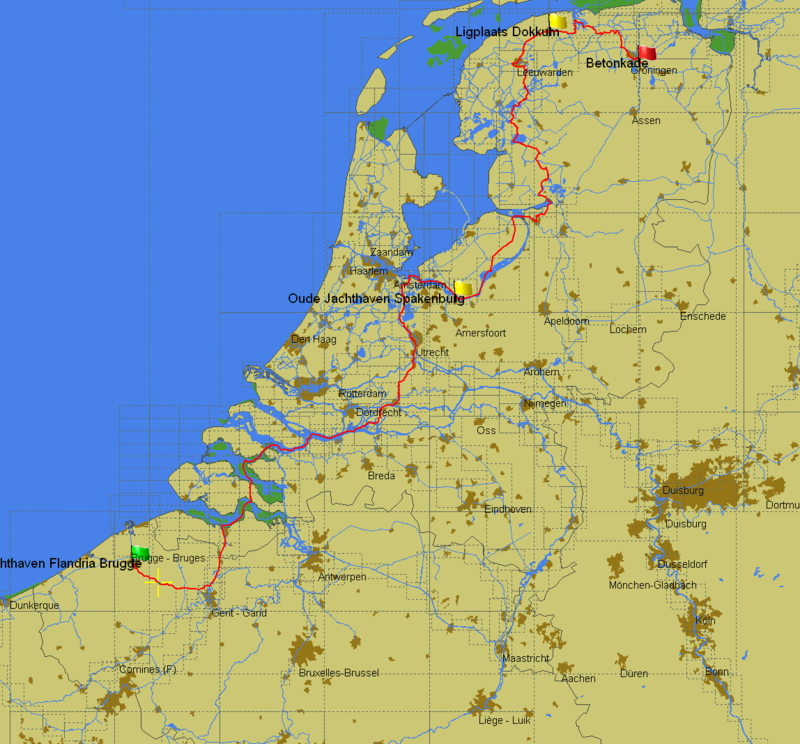 continue west, and whatever you do, don’t miss Haarlem and Gouda. Look at our blogs from July 2013 for a flavour. Thanks Michael, it was a strategy on our list. Better than that, however, we’re reading your book! Electronically I’m afraid, getting a hard copy shipped here was prohibitive. Well done on your endeavours – braver you than me taking a 20m barge into the waterways as first timers! You are aware that in NL you may fly the flag of either the country of citizenship of the owner or the country of registration of the boat? We preferred to fly a SA flag on the stern and a Dutch courtesy flag from the spreaders. Good luck for 2015 and we might bump into you in Belgium in September. I’m certainly not an expert, and the subject is much discussed on the DBA Forums. I’m inclined to fly our flag whatever. The Dutch are pretty easy going. Hope we do catch up. Is your barge on the DBA register Shaun? I omitted to compliment you on your boat – a real beauty indeed and one to be very proud of.